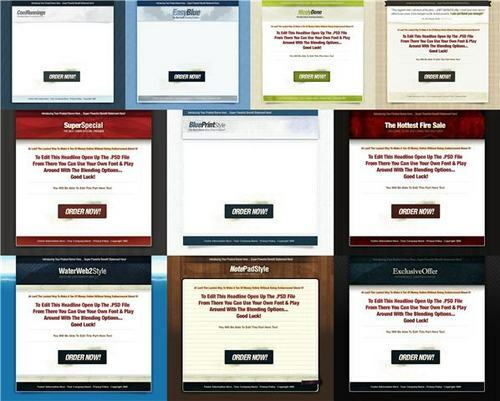 10 Amazing Minisite Templates Pack-with 2 Mystery BONUSES! Comes with two UNANNOUNCED BONUSES! Get 10 Unique Mini-Site Templates! You are going to be getting 10 different unique mini-site templates to fit almost any project you or your clients will need. Each one designed by an industry design leader, and hand crafted to perfection! a) A .PSD file - you are free to change anything you like. b) An easy-to-edit .html/.css files - you can simply copy & past your sales copy. c) An easy-to-follow tutorial in PDF format! This template is a stunning example of how creative old paper effects can used to unravel a secret, or introduce a new tactic. An awesome textured background and nice flow will allow you to easily create a stunning sales presentation with this template! This showcases a popular "testimonial" headline, sometimes testimonials are that powerful! Simple, but nicely done! If you are ever in a rush to get something up and running this template will help you do so easily! It has a nice green tone and it's ready for you to go in and add your product image, and sales copy. This template is perfect choice for you if you need something that is easy on the eyes but packs the punch you are looking for! It is designed to be fit the calming effects of blue, so you can be sure that your visitors will be happy to see your message! This is perfect for any self-development, "make money online" niche, or stock trading - in fact it can work for any niche really! This is a bit more mature template than the others because it has the nice darker blues that scream professionalism. CoolRunnings has a nice subtle but sharp textured background that gives it the polished look that you're looking for! Got a blueprint? A step-by-step ebook? Or a workable system that anyone can use? Well this template is perfect for you! The BluePrintStyle is perfected for any tutorial based product because it has the old time feel of the "drawing board". You can easily get across the idea of a workable system with this template! It showcases fun web 2.0 starbursts in the header and can be easily used for any project you are working on. The background has a nice repeating background that has that polished professionalism appeal! A true winner! The top banner has subtle flames and charred corners, just add your logo and flavor the template and your done! This template is designed to be a bit more high-class, and "invite only" type design. Inspired with the clean style of web 2.0 but also has the stunning underwater effect that will impress all your visitors and get them instantly involved in your marketing message! This is a perfect example of how you can have beautiful realism with subtle web 2.0 styles. This is the perfect template for any offer that needs that hand-written inspired design. Designed to fit any niche and it will allow you to achieve the much sought after note pad effect so that you can bring more believability to your offers. This is such a hot effect and design that we had to put it last because we know this will be a favorite among many! BONUS#1: 21 Header Graphics Templates - FULLY Customizable! (PLR): This package contains 21 header templates in .PSD format and .JPEG format (blank), plus 21 sample templates in .JPEG format. These 21 headers are FULLY Customizable! To make the deal even sweeter for you, we are even including two unannounced bonuses with it! Only those who purchase this product from us would be able to get the bonuses at NO cost! So what are you waiting for? Order today. In case you are not 100 percent satisfied with your purchase, simply contact us within 30 days of your purchase and we will refund every penny! No questions asked! 10 Premium Pre-Made Headers Pack - MRR + 2 Mystery BONUSES! Ultimate Web 2.0 Marketing Pack + 2 Mystery Bonuses! 5 Minisite Templates - With Full Private Label Rights+bonus! Ultimate Photoshop Action Scripts Pack + 2 Mystery Bonuses!